The 2010–11 Liga I was the ninety-third season of the top-level football league of Romania. The season commenced on 23 July 2010 and ended on 21 May 2011. A winter break where no matches were played was held between 11 December 2010 and 18 February 2011. A total of eighteen teams participated in the league, where CFR Cluj were the defending champions. Politehnica Iaşi, Ceahlăul Piatra Neamţ and Unirea Alba Iulia were relegated to Liga II after finishing the 2009–10 season in the bottom three places. Ceahlăul Piatra Neamţ and Unirea Alba Iulia made their immediate return to the second level, while Politehnica Iaşi ended a six-year tenure in the highest football league of Romania. 15th-placed team Pandurii Târgu Jiu, who originally were to be relegated as well, were allowed to remain in Liga I after Internaţional Curtea de Argeş withdrew from the league because of financial reasons. Internaţional thus returned to Liga II after having been promoted the previous season. The four relegated teams were replaced by the champions and runners-up from both 2009–10 Liga II divisions. Victoria Brăneşti and Sportul Studenţesc were promoted from Seria I while Târgu Mureş and Universitatea Cluj were promoted from Seria II, with Victoria Brăneşti and Universitatea Cluj being constrained to play their home games on grounds in other cities (than home based) as their did not meet Liga I requirements. ^ Pandurii Târgu Jiu was relocated to Municipal Stadium from Drobeta-Turnu Severin from the 11th round because Tudor Vladimirescu Stadium from Târgu Jiu was under renovation. ^ Victoria Brănești was relocated to Municipal Stadium from Buzău until the 23rd round and then to Concordia Stadium from Chiajna because Cătălin Hîldan Stadium from Brănești does not meet the standards for Liga I. ^ Universitatea Cluj was relocated to Cetate Stadium from Alba Iulia until the 19th round because Cluj Arena was under construction and then was relocated to Gaz Metan Stadium from Mediaș. ^ Gaz Metan Mediaș was relocated to Municipal Stadium from Sibiu until the 10th round because Gaz Metan Stadium from Mediaș was under renovation. ^ Capacity of Cetate Stadium has been reduced from 18,000 to 8,000 due to security reasons. ^ a b Timişoara and Gloria Bistriţa were denied a licence for the 2011–12 season because of accumulated debt and were therefore relegated to Liga II. Sportul Studenţesc as the only team from the relegated sides holding a Liga I licence were hence spared from relegation. ^ Steaua Bucureşti won the 2010–11 Cupa României competition and therefore qualified for the play-off round of the 2011–12 UEFA Europa League. ^ This match was awarded to Oţelul 0–3 because of debts not paid in time by Pandurii. 1 Bogdan Stancu was transferred to Galatasaray during the winter transfer window. ^ "Comitetul Executiv al FRF a stabilit calendarul competitional pentru sezonul 2010–2011!". sportlaminut.ro (in Romanian). 11 March 2010. Archived from the original on 8 March 2012. Retrieved 28 June 2010. ^ "Echipa Pandurii scapă de a doua retrogradare în patru ani". mediafax.ro (in Romanian). 15 July 2010. Retrieved 17 July 2010. ^ "Noul echipament!". 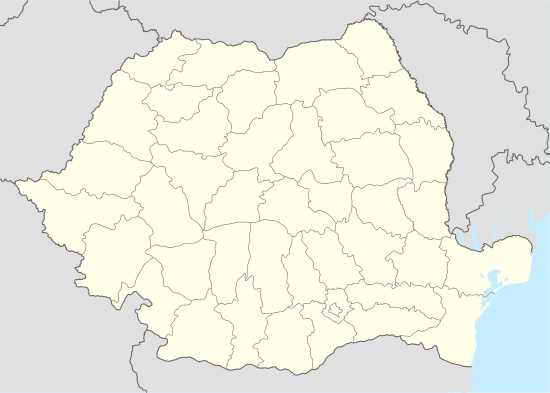 otelul-galati.ro (in Romanian). 4 May 2010. Retrieved 28 June 2010. ^ "Piţurcă resigned from Steaua". Stelisti.ro. Stelisti.ro. 9 August 2010. Retrieved 9 August 2010. ^ "Dumitrescu is the new coach of Steaua". GSP.ro. GSP. 10 August 2010. Archived from the original on 20 August 2010. Retrieved 10 August 2010. ^ "Levy announced that he resigned with Unirea". GSp.ro. Gsp.ro. 21 August 2010. Archived from the original on 24 August 2010. Retrieved 21 August 2010. ^ "Aurica Ticleanu was sacked!". prosport.ro. ProSport. 22 August 2010. Archived from the original on 24 August 2010. Retrieved 22 August 2010. ^ "Piţurcă , finally comes home". GSP.ro. GSP. 26 August 2010. Archived from the original on 29 August 2010. Retrieved 26 August 2010. ^ "Mihai Stoichita sacked from Astra". prosport.ro. ProSport. 31 August 2010. Archived from the original on 2 September 2010. Retrieved 31 August 2010. ^ "Tibor Selymes signed with Astra". prosport.ro. ProSport. 6 September 2010. Archived from the original on 9 September 2010. Retrieved 6 September 2010. ^ "A doua "victimă" a etapei a 6-a! Falub a plecat de la Tg. Mureş". 31 August 2010. Archived from the original on 4 September 2010. Retrieved 31 August 2010. ^ "Sabau, officially introduced as Tg. Mures new coach". 3 September 2010. Archived from the original on 6 September 2010. Retrieved 3 September 2010. ^ "Tibor Selymes signed with Astra". gsp.ro. gsp.ro. 6 September 2010. Archived from the original on 9 September 2010. Retrieved 6 September 2010. ^ "Viorel Moldovan is the new coach of Sportul Studentesc". gsp.ro. gsp.ro. 9 September 2010. Archived from the original on 11 September 2010. Retrieved 9 September 2010. ^ "Mandorlini sacked from CFR!". Ziare.com. 13 September 2010. Archived from the original on 16 September 2010. Retrieved 13 September 2010. ^ "Cârţu signed with CFR!". gsp.ro. Prosport. 13 September 2010. Archived from the original on 14 September 2010. Retrieved 13 September 2010. ^ "Petrović signed with Serbia!". Violamania.ro. 15 September 2010. Archived from the original on 17 September 2010. Retrieved 15 September 2010. ^ "Contra announced new head coach of Poli!". Violamania.ro. Violamania. 13 September 2010. Archived from the original on 18 September 2010. Retrieved 13 September 2010. ^ "Ilie resigned from Steaua". Gsp.ro. 21 September 2010. Archived from the original on 23 September 2010. Retrieved 21 September 2010. ^ "Pandurii sacked Badea". Gsp.ro. 2 October 2010. Archived from the original on 5 October 2010. Retrieved 2 October 2010. ^ "Pandurii hired Grigoraş". Gsp.ro. 2 October 2010. Retrieved 2 October 2010. ^ "Lopez Caro şi-a reziliat contractul cu FC Vaslui! Citeşte comunicatul avocaţilor spaniolului!". Gsp.ro. 9 October 2010. Archived from the original on 12 October 2010. Retrieved 9 October 2010. ^ "Hizo a condus primul antrenament la Vaslui: "Avem şanse la titlu!"". Gsp.ro. 9 October 2010. Archived from the original on 12 October 2010. Retrieved 9 October 2010. ^ "Reghecampf sacked from Gloria". Gsp.ro. 23 October 2010. Archived from the original on 26 October 2010. Retrieved 23 October 2010. ^ "Manea takes the charge of Gloria". Ziare.com. Ziare.com. 22 October 2010. Retrieved 22 October 2010. ^ "Tene confirmed new Sportul Studentesc's manager". ProSport. ProSport. 1 November 2010. Retrieved 1 November 2010. ^ "Universitatea Cluj' Marian Pană resigns". Asport.ro. ASport. 8 November 2010. Retrieved 8 November 2010. ^ "Badea signed with Universitatea Cluj". MediaFax. MediaFax. 25 November 2010. Retrieved 25 November 2010. ^ "Cârţu sacked from champions CFR Cluj". EVZ.ro. EVZ. 24 November 2010. Retrieved 24 November 2010. ^ "CFR Cluj's owner Pazkany announced that Minteuan is the new manager of Cluj". Ziare.com. Ziare.com. 24 November 2010. Retrieved 24 November 2010. ^ "Undefeated Cosmin Contra surprising sacked from Poli Timişoara". Libertatea.ro. Libertatea. 4 December 2010. Retrieved 4 December 2010. ^ "Uhrin returns to Poli to win the title". Libertatea.Net. Libertatea. 13 December 2010. Archived from the original on 15 December 2010. Retrieved 13 December 2010. ^ a b "Conceicao, officially presented at FC Braşov". prosport.ro. ProSport. 18 December 2010. Retrieved 5 June 2011. ^ "Unirea Urziceni has a new coach". ziare.com. Ziare.com. 17 February 2011. Retrieved 6 June 2011. ^ "Surprise! Victor Piţurcă sacked from Craiova by chairman Mititelu". ProSport.ro. ProSport. 13 January 2011. Retrieved 13 January 2011. ^ "Nicolò Napoli returns to Craiova". Jurnalul.ro. Jurnalul National. 15 January 2011. Retrieved 15 January 2011. ^ "Trilogie fără happy-end! Cifrele celui mai slab mandat al lui Lăcătuş la Steaua". prosport.ro. ProSport. 8 March 2011. Retrieved 6 June 2011. ^ "The 14th coach in Becali era: Cîrţu!". prosport.ro. ProSport. 9 March 2011. Retrieved 6 June 2011. ^ "Gigi Mulţescu, close to a comeback at Sportul Studenţesc". prosport.ro. ProSport. 15 March 2011. Retrieved 6 June 2011. ^ a b "Reghe ştie cu ce material lucrează la Craiova: "Avem valori, n-avem echipă"". prosport.ro. ProSport. 5 April 2011. Retrieved 6 June 2011. ^ "Ilie Stan, the manager who promoted Victoria Brăneşti, resigned from the club". prosport.ro. ProSport. 20 April 2011. Retrieved 6 June 2011. ^ "Ilie Stan a demisionat din functia de antrenor al Victoriei Branesti". victoriafc.ro. Victoria Brăneşti. Retrieved 6 June 2011. Pana la sfarsitul campionatului, antrenor principal al echipei a fost numit Ciprian Urican. ^ "Officially Şumudica has been sacked from Rapid!". sport365.ro. Sport365. 27 April 2011. Retrieved 6 June 2011. ^ "Marian Rada l-a înlocuit pe Marius Șumudică pe banca tehnică". FCRapid.ro. Rapid Bucureşti. 28 April 2011. Archived from the original on 25 July 2011. Retrieved 6 June 2011. ^ "Reghecampf, sacked by Mititelu at less than a month from appointment". jurnalul.ro. Jurnalul Naţional. 1 May 2011. Retrieved 6 June 2011. ^ "Circus maximus! Vezi aici filmul îndepărtării incredibile a lui "Reghe" de la Craiova". prosport.ro. ProSport. 2 May 2011. Retrieved 6 June 2011. L-a chemat pe Ţicleanu la ora 2:00. După ce a ajuns la Mititelu, actualul preşedinte a aflat că trebuie să conducă până la finalul campionatului de pe bancă Universitatea. ^ "Sorin Cârţu resigned from Steaua". ziare.com. Ziare.com. 4 May 2011. Retrieved 6 June 2011. ^ "Haos în Bănie! Ţicleanu şi-a dat demisia înainte de meciul cu Dinamo! Culisele rupturii dintre tehnician şi patron". prosport.ro. ProSport. 7 May 2011. Retrieved 6 June 2011. ^ "Timişoara and Bistriţa did not receive the license and they are relegated" (in Romanian). Onlinesport.ro. Archived from the original on 29 May 2012. Retrieved 31 May 2011. ^ "Pandurii match not scheduled because of debts, Oţelul wins 3–0". prosport.ro. ProSport. 23 February 2011. Retrieved 6 June 2011.